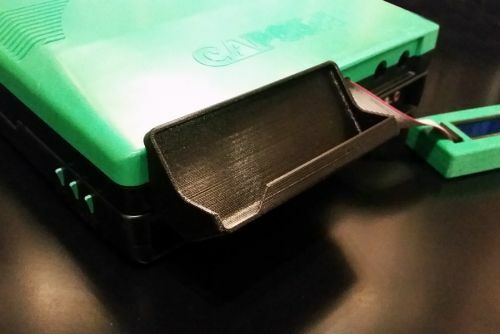 A Companion product to our CPS2 Multi LCD Housing this item attaches to the front of your Capcom CPS2 B-Board housing and provides a secure mounting point for your the LCD module of your Darksoft Capcom CPS2 Multi. This holds the LCD in place at a 45 degree angle to allow for easy visibility and use from the front or the top of the PCB. The LCD unit is held in place securely enough that you can turn the PCB upside down witout it falling out, yet it can also be popped out of it's holster with one hand to be used remotely. Installation requires no modifications to your existing equipment and no additional screws or fasteners. NOTE:Installation and removal requires opening up your B-board case (see installation instructions below) This ensures a very secure attachemtn to the case. Attempting to install or remove the holster without first opening your b-board case is not recommended as doing so could cause damage to the holster or your case. Due to the location of the holster it may cause fitment issues with some SuperGun setups. If you would like to use the holster and think your may have fitment issues with a supergun we would recommend the use of a JAMMA harness extender.